A growing number of people realize the value of being involved with their own food sources. Raising your own chickens for meat is a logical step. Small-scale production maintains a sustainable approach, and keeps the process of raising chickens for meat accountable, organic, and deliberate. What Does Raising Chickens for Meat Involve? Your municipality may have restrictions or licensing requirements; roosters are sometimes banned in residential areas. Even in rural areas, check for local ordinances before you begin. If you already have a laying flock you are familiar with keeping chickens. The birds will need food, water, and shelter for 2-3 months. Their health needs to be maintained. It’s also important to remember that meat birds are not pets. They’re food. Can you do it? The decision to kill your own meat is not to be taken lightly. Consider partnering with a local farmer, or participating in a co-op to gain experience. If you have doubts about your ability to go through with it, consider choosing dual-purpose chickens that could become egg-layers instead. If you do want to raise chickens for meat organically, consider the following points. The chicks. Expect 5% mortality rates, higher if you are in an area with many predators. Include shipping costs for mail-order chicks. Housing. This can be a temporary or permanent structure. Include the cost of brooders or lamps for the young chicks. The feed. A 6-week broiler takes 5 pounds of feed per chicken. An 8-week meat bird needs about 9 pounds. Feed efficiency decreases as chickens get older. Processing and butchering. Include the cost of supplies, equipment, and meat-packaging. If you plan to use butchering services calculate for that. Expect the table weight to be 70% of the live chicken’s weight. Divide your projected expenses by potential yield to estimate the economic value of raising chickens for meat. When raising chickens for meat select genetically larger breeds. Cornish Cross produce a 5-pound bird in 6-7 weeks. The meat is light and firm without being stringy. They’re widely available and one of the most common choices for a first flock. Cornish crosses tend to get broken legs and have heart issues associated with rapid weight gain. European hybrids reach 5 pounds in 12 weeks. They are considered more flavorful, with a firmer flesh. European types are well-suited to pasturing and yield a higher percentage of dark meat. Heirloom breeds and dual-purpose chickens are slower growing but have a greater foraging capacity. They are also more disease resistant and hardy. Dual-purpose chickens are preferred by those who want a laying flock with the option to occasionally cull a bird for dinner. When raising chickens for meat instead of eggs, the coop can be temporary. Any small building with a roof and adequate square footage will do, or use a tarp over a tractor-style pen. The goal is to protect from summer storms and provide shade. Meat chickens require only 1-2 sq.ft per bird. For dual-purpose flocks allow 2-3 sq.ft. per bird with access to an outdoor yard. Electric net fencing is easy to set up and take down, allowing for fluctuating flock sizes. Be mindful of what predators are in your area when selecting your fencing. Disinfect the coop, feeder, and watering equipment before use and provide clean fresh litter. Use leaves, straw, or wood shavings 2-3 inches deep and remove caked litter. Young chicks need to be kept warm (90-95° F). As they age they can be weaned 5 degrees per week, but a brooder will be necessary to start. Electric brooders for a small flock can be contrived with a cardboard box and incandescent light bulb (aka heat bulb). Watch behavior to gauge comfort levels, i.e. if the chicks are cold they will huddle under the lamp. Allow 7-10 square inches per chick in the brooding space. If you’re raising chickens for meat organically, the main concern is chemical-free, wholesome food and water. Rain-water or pure well water is best. Filter municipal water to remove chlorine, etc. Allow 1-gallon fresh water daily for 10-15 chickens. Keep pastures free of pesticides and herbicides. 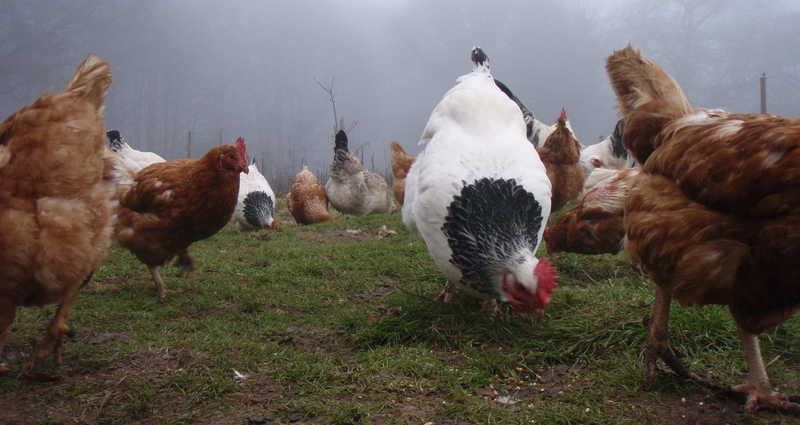 With meat birds, pasture is more a lifestyle choice and doesn’t really reduce feeding. A complete feed is the most convenient for a small flock. There are organic feeds available commercially, but many contain GMO-corn or soybean so read labels. Start with a 22%-24% protein feed for four weeks. They’ll gain better on higher protein diets so stay at 20%. Be aware that mix-your-own recipes available on the internet are often geared towards laying hens on lower protein diets. Add-in mealworms, solder flies, milk, or fishmeal to boost protein. Maintaining clean litter and good ventilation, preventing overcrowding, and isolating new flocks or rotating pasture prevents many of the problems associated with raising chickens for meat. Immunizations are given to most hatchery chicks and you should look for pullorum-typhoid clean stock. Hatcheries can debeak chicks, but good management practices usually prevent cannibalism and feather picking. To decrease mites and lice provide a dust bath with diatomaceous earth. Most health issues can be prevented with simple sanitation and hygiene practices. Raising chickens for meat means you control the farm-to-table process from start to finish. You decide the quality and sustainability of good-tasting healthy food for your family. What is your experience? Do you have different concerns? Does your location present unique challenges? If you’ve raised chickens for meat please share your stories with us. Hey Buddy!, I found this information for you: "Raising Chickens for Meat Organically: 6 Things to Consider". Here is the website link: https://backtofarm.com/raising-chickens-for-meat/. Thank you.